Ever since I first saw the Displacer Beast in my hand-me-down copy of the AD&D Monster Manual, I was smitten with it. I'm not 100% sure why, but I suppose it embodies what I love about D&D. Familiar enough to have context, but fantastic and different and magical. I wish I could hear the conversation that led to the development of the creature. "it's like a panther... but with... uh... tentacles! Yeah! Oh and 6 legs! And also, it sort of teleports all over the place!" I really like their implementation in 5e. I picked up 3 blisters of this mini, but only painted the one as a test. The remaining two are on my desk right now to be wrapped up! Ireena steels herself after her father and brother are buried, and returns to the mansion. She takes a few belongings, then steps outside. 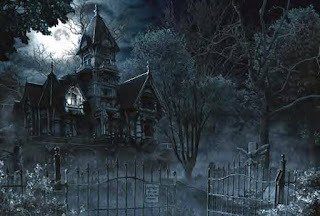 As the party watches, she lights a torch, and sets fire to the mansion, and watches it burn for some time. 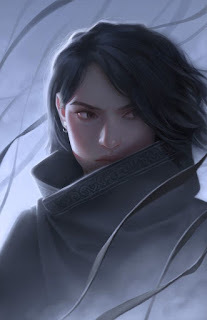 She returns to the party, “We should rest. Set out for Vallaki tomorrow morning.” the party, severely beaten and bloodied from their harrowing ordeal, do not offer much resistance. Caecilius informs the party that he intends to find the priest Donavich. The rest of the party acknowledges him, but heads to the Blood on the Vine Tavern. There they speak with the shell-of-a-man Arik, and secure 3 rooms. Ava collapses, while Vrice and Driessa stay in the same room with her, resting. Ireena takes one of the rooms for herself, and rests as well. 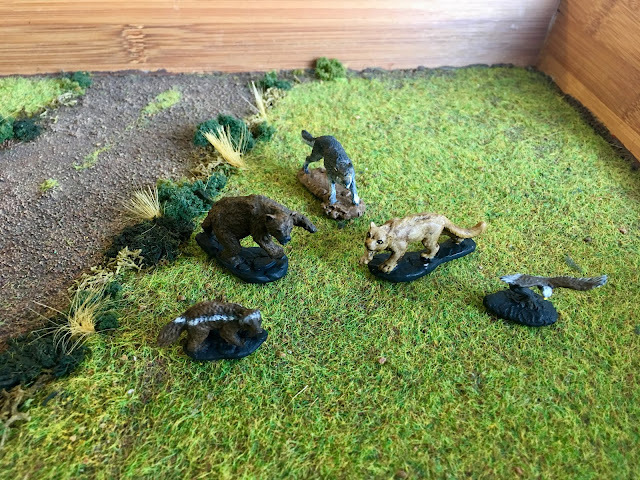 Miniature Review: Dire Wolves and Wargs! Alright! We're back with our second product review; though this time it's 3 different products! 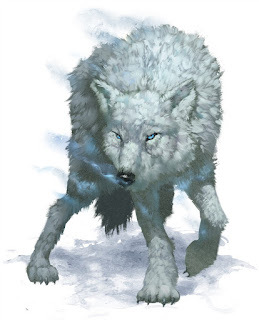 As part of our adventures in Barovia, I knew I needed wolves. Lots of them. 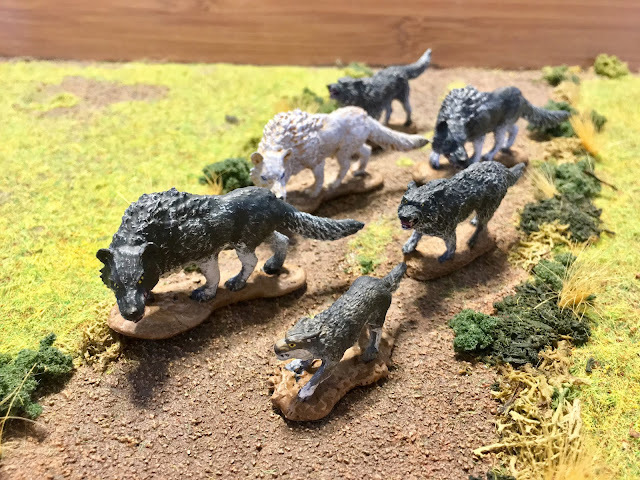 So, starting with the one from the Reaper Bones Animal Companions set, I grabbed a few more blisters of wolves, all by Reaper as well. The wolf from the Animal Companions set. Ivy the wood-elf cleric, Tifatina the gnome druid, Trajek the half-orc druid, and Finbin the halfling ranger set off in pursuit of their quarry. 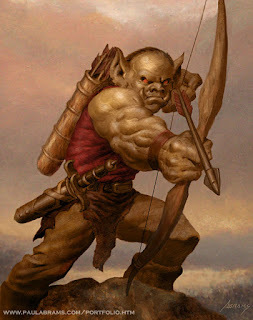 Finbin led the way, his hatred of goblins fueling his tracking skills. 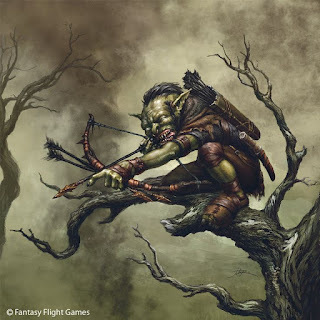 Evading a snare trap, and a pit trap along the tiny path it was evident the goblin either did not want to be found or expected to be pursued. Hello! Welcome to a new series I'll be chronicling here at Castle Mac where I review the D&D figures I've recently painted. I will warn you up front: The pictures aren't fantastic, nor is the painting... but the volume is! 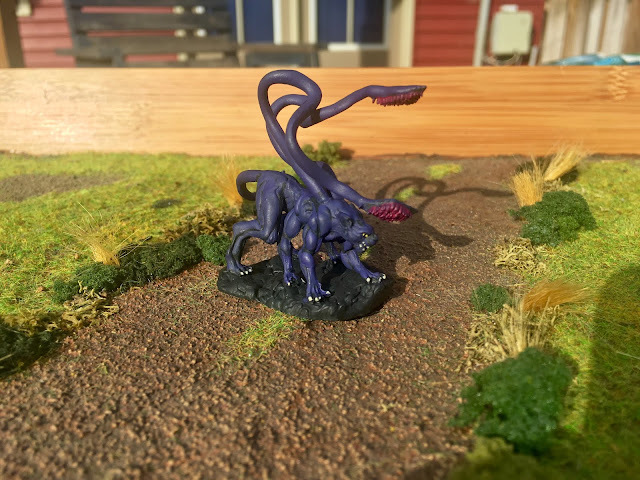 I paint to a tabletop standard for these guys since I know many of them will see one encounter every few months, if they're lucky. I'll work on the picture quality, promise! Review: I picked these up to just help flesh out my collection for familiars, wild shapes, and the occasional baddie. Like all of Reaper's Bones line, the figures are a plastic-y vinyl material that does not take primer well. But, I'm an old dog and can't learn new tricks, so I still prime them. They have a tacky feel to them until paint hits them... but I'm used to working with them now. Not sure how to explain where I am. Whisked away to a cursed land. My companions and I took on a quest to defeat a cursed lord, but were brought to this place that he controls absolutely. This place is akin to had tiamat come back. Yet that would be just destruction, nearly all dead and those left giving tribute to her. This place is like a cat ruling a land of mice. Toying with them for its own pleasure over lifetimes. No sun shines and souls are finite and rare. This place is a prison built by the devil. We resume our story as the company is about to set off on their very first adventure! It’s a matter of walking next to a cart from one town to another. Finbin, Ivy, Tifatina, and Trajek were all warned that the trail could be rough, but how rough could it be? The adventurers met up with the supply cart and oxen at the western end of the market square. Gundrin and Sildar had left the day before to meet them when they arrived at Phandolin. DM NotesThe party rests in the Bergomeister’s mansion. Ava channels her new-found divine magics to cast Gentle Repose on the body of the Indirovich, the former bergomeister, and halts the decay. Caecilius gives in to his exhaustion, and collapses in one of the bedrooms offered by the siblings. Vrice and Driessa inquire as to the attacks, and set about fortifying the mansion. Ismark assist them, and tells them all manner of undead and wolves have attacked previously. Ireena is unsure why she has been targeted, but does indicate that other women have been taken before. None have had this degree of terror flung upon them. Vrice and Ismark fortify the windows, and prepare an escape route by knotting a rope and tying it to a sturdy bed in the upstairs of the mansion. Driessa takes what butter remains in the kitchen, and coats the window sills, hoping to slow any creatures who may break through. The party chats idley, but mostly awaits nightfall. The town of Neverwinter never seems to stop moving while the sun is up. There is too much work to be done after the Dragon Cult ravaged the land for everything it had. In order to attempt at bringing back the God-Dragon Tiamat to the living plane. The entire surrounding land was pillaged and plundered. Neverwinter is the location we join our adventurers just before their whole lives are changed. Here's another one by the excellent Ollie Boldador. I really love his art style; he did a great job of running with the character descriptions, and I just love the warm tone. In the back left is Kothai the Goliath Barbarian. In the front left is Ennis Naïlo he High Elf cleric. In the center there is Sallos Zha Zoala, Bard/Rogue. In the back right is Nithbis, Tiefling druid. And front and center is Harbek, Dwarf Paladin. 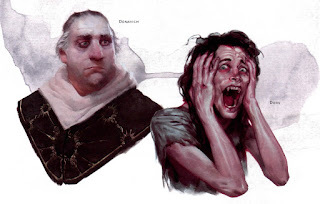 By the end of the campaign Harbek was ruthlessly murdered by cultists, and Sallos died to Tiamat, with his soul being imprisoned in the 9 hells. Recently, one of my regular groups was to be sans DM for two weeks due to some work travel. One of the players decided to run a 2 parter mini-campaign for me and the remaining player. We'd be level 5 and the challenges would be very difficult. 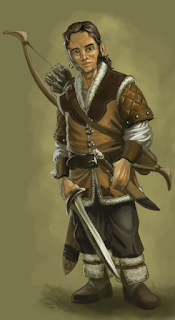 I was excited to try a class I have never played, and so I made Drevin Boer, the variant human level 5 Circle of Moon Druid. I took Mobile as a feat, and promptly forgot I had it for the duration of the campaign (not sure it would've ever come up...) My comrade ran a level 5 rogue. Together we were a pretty good force to be reckoned with. The DM wove the campaign into our growing tapestry of "Castle Mac Canon", with subtle cues to tie into the other world, and that eased us right into the characters by making the world feel lived in. Despite only going for two nights, it felt fully realized. The encounters were memorable, the role-playing was top notch, and it was just generally a good time. After some debate, the party decide they have no better choice and they enter the carriage. As soon as they are all aboard, the horses again pull the carriage. Black pools of water stand like dark mirrors in and around the muddy roadway. Giant trees loom on both sides of the road, their branches clawing at the mist. The carriage sways slowly on as the horses silently pull their burden. Looking behind them, the party sees the fog spill out of the forest to swallow up the road behind them. Ahead, jutting from the impenetrable woods on both sides of the road, are high stone buttresses looming gray in the fog. Huge iron gates hang on the stonework. Dew clings with cold tenacity to the rusted bars. Two headless statues of armed guardians flank the gate, their heads now lying among the weeds at their feet. They greet the party only with silence. In the town of Goldenleaf, there is a tangible excitement as two of the heroes of the great Dragon War are in town: Nithbis and Aesir. Celebrations break out, and the mood is jovial. Driessa and Ava both find themselves at home in the spontaneous celebrations. Ava perfectly imitates a Bard, and the bard then harmonizes with her mimicry. The crowd loves the performance, and Ava quickly becomes a bit of a local celebrity. At first, she is overjoyed to have the attention, but her growing frustration at her inability to communicate back sees her withdrawn and a bit sullen. Driessa takes to the social scene with grace, and becomes the life of the party. The atmosphere picks up yet again when another familiar face shows up: Ennis, riding atop her Golden Elk Caywin, escorted by an unknown Elven archer. Ennis disappears into Nithbis’ sanctuary. This was artwork I had done for my wife's birthday. 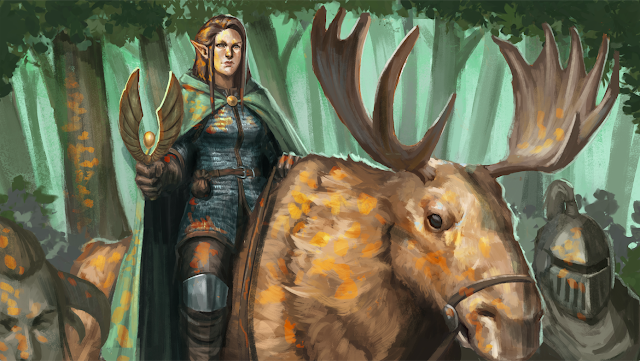 Her character, Ennis, is a badass cleric who rides atop a golden elk named Caywin. The artist who did this work was Olie Boldador. Quite happy with it, check out his Twitter here! I was standing on the corner of the market looking over the silvered sword I bought. Would have stayed with Vrice, but the blacksmith asked too many questions. I heard a voice behind me. 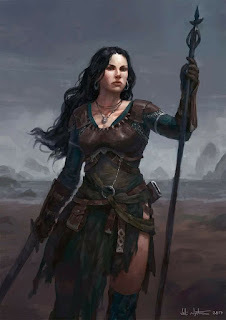 “How bout a drink, dragon man?” Jhaia, the giant slayer, was holding a skin full of ale. She had some sort of smile on her face. Never seen a human look at me like that. I nodded to her and took a swig. “Aye. Sorting through what kind of work he has for us. Strange one, huh? Stutters like a drunkard, but that sword hand could still cut a path through half this town I reckon. That face. Shame. He was handsome before.” She was staring off as she said this, until she turned to me and smiled. “You like him?” She added. “I don’t like anybody, but he is capable and trusted around here. I don’t doubt he was a fine warrior.” I took another swig and passed the skin back. She took a swig and eyed me. 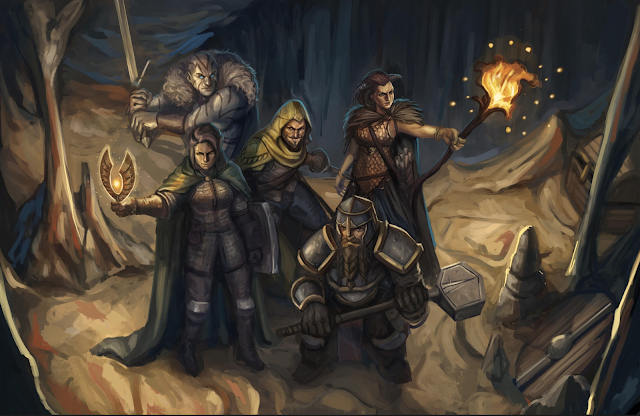 Commissioned artwork of one of my parties!